You are here: Home / News / News, Propaganda / Toy Soldier Day 2017! March forth to a Utopian Playland! Today is March 4th, and upon this day 11 years ago Toy Soldiers Unite & The Army of Toy Soldiers was founded. Every year we celebrate it by taken the day to ourselves to do the things that make us happy, to fuel our pineal gland and stoke the fires of our creativity and imagination! This year I am very glad to present to you this little video which is the culmination of submissions by Toy Soldiers who wanted to show the world their passions! With music by Dr. Malice & The Absinthetic Orchestra, we hope you’ll share this with friends, family, strangers, unwitting victims, and your dog Gusto. I honestly wish I could’ve shown the entirety of the videos submitted to TSU-HQ, because they were all brilliant! And for every single comrade who submitted a video, I know there are a thousand more who are doing the same thing, pursuing their passion, engineering their reality, and marching forth towards a Utopian Playland! Next Next post: ‘Tis but a refactor – Mad Monkey Maintenance inc. Damn, I’m always late to the party. Glad to see that there are plenty of others that are on the ball though. Seeing people do what they love just makes me feel so warm and fuzzy! 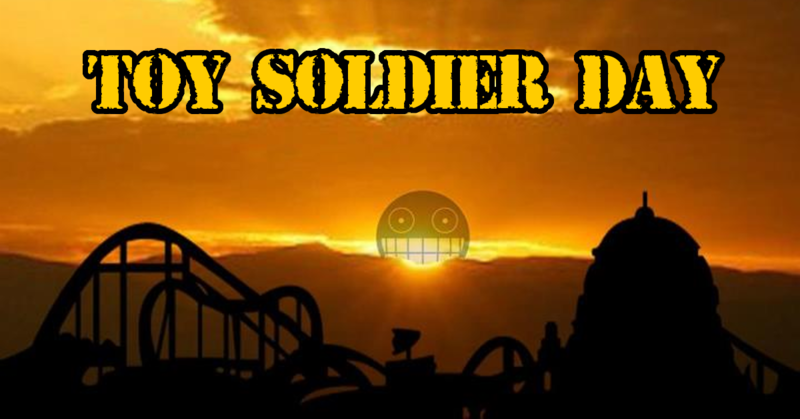 I hope everyone has a fantastic Toy Soldier Day! I love the video. :D Well done, Sergeant Dutch, and everyone else that sent in their little videos. Itg’s been a long time. I know I never post on the boards but I’m always lurking. Happy Toy Soldier Day everyone.